Gold medal winner Yuriy Bilonogof of Ukraine (right), wraps his arm around silver medal winner Adam Nelson of the U.S. on the podium for the shot put at the 2004 Olympic Games in Athens. However, Bilonogof was stripped of his gold in 2012 following a failed steroid test. Nelson was named the winner and honored at a ceremony on July 1 at the U.S. Olympic Trials in Eugene, Ore. The Olympics are less than a month away, and there's still no final decision on whether some Russian track and field athletes will be allowed to compete in Rio. Russia has appealed a ban imposed after evidence of wide-ranging, state-sponsored doping. The Court of Arbitration for Sport is expected to decide by July 21 whether individual Russian track and field athletes can compete. This case, and the larger question of doping, is a hot topic of discussion at the U.S. Olympic Trials in track and field trials currently underway in Eugene, Ore. In fact, it was impossible to ignore. On the first day of the trials, July 1, shot putter Adam Nelson was honored with an unusual gold medal ceremony. Such a ceremony is normally is a happy occasion, but this was bittersweet. 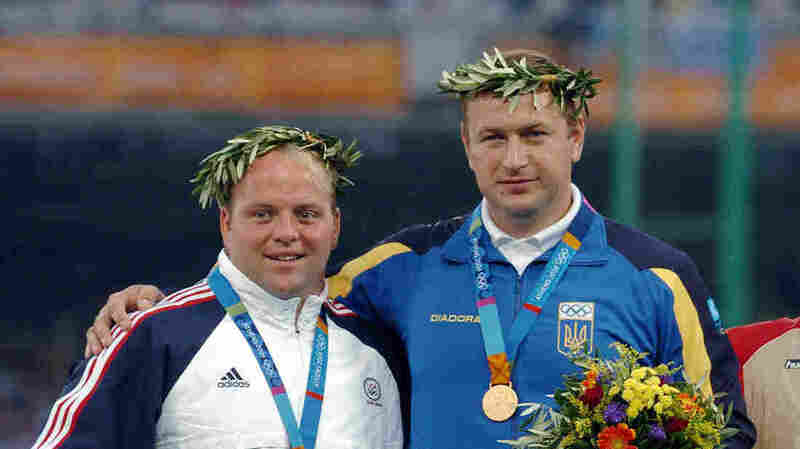 Nelson smiled as he stood above the crowd in a stadium end zone, a victory wreath on top of his head, to receive an Olympic medal he should have been given way back in 2004. 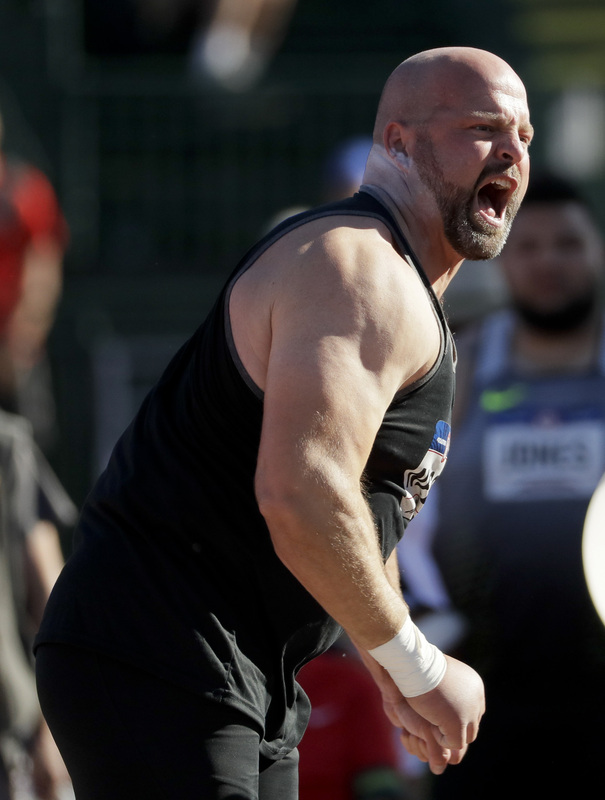 Adam Nelson reacts during the men's shot put final July 1 at the U.S. Olympic Trials for track and field in Eugene, Ore. Nelson, 40, finished seventh and failed in a bid to make his fourth Olympic team. Bilonoh was stripped of the gold and Nelson was named the retroactive winner of the 2004 competition. In what had to be one of the most underwhelming Olympic victory moments ever, the medal was hand-delivered to Nelson in a food court at the Atlanta airport. Track officials in Eugene thought Nelson deserved better. So did the thousands of fans who cheered Nelson last week at Hayward Field. 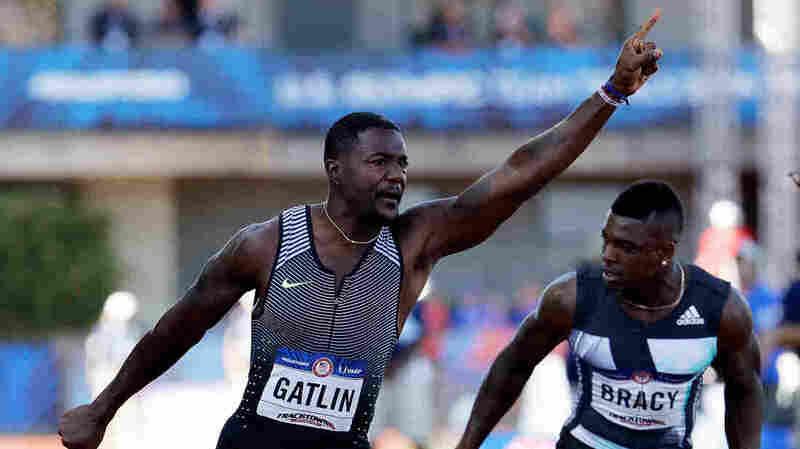 Fans demonstrated more mixed feelings the next day, when Justin Gatlin, America's best sprinter, blazed down the track in 9.80 seconds to win the 100 meters on Sunday. It was the best time in the world this year, and it earned Gatlin a spot on the Olympic team. But along with the excitement on the track, there was a quiet protest in the stands. Over the weekend, about 30 people at Hayward Field wore T-shirts bearing the slogan "Runners Against Doping." The action targeted Gatlin, as well as fellow sprinter Tyson Gay, who tried but didn't qualify for the 100 meters. Both men have served doping suspensions. Gatlin, 34, was suspended twice, testing positive in 2001 and 2006. There's still a debate within track and field whether or not Gatlin cheated. Gatlin has claimed there were valid reasons behind his positive tests that had nothing to do with performance enhancement. Gatlin was willing to talk about the Russian scandal. He was asked whether Russian athletes, if they prove they're clean, should be able to go to Rio even though the Russian Track Federation is banned. "You gotta think about 'fair is fair,'" he said. "If an athlete has come and he's been tested or she's been tested, and they've passed the test, I don't think they should be, y'know, basically prosecuted or make a statement with other people who've done wrong." Oiselle, the women's apparel company that organized the T-shirt protest, sponsors distance runner Stephanie Bruce. She's more skeptical of Russian athletes who claim innocence. "How long have you been running in a culture like [in Russia] and you don't know that it's going on? And you haven't come forward?" Bruce says. "Like you're totally oblivious that coaches or organizations [are involved in illegal doping] ... so that seems strange to me." Justin Gatlin celebrates victory in the 100 meters at the U.S. Olympic Trials for track and field. Gatlin has been suspended twice for failing doping tests, once in 2001 and again in 2006. Adam Nelson, the man unfairly denied a shot put gold medal back in 2004, takes the hardest line. "I think it kind of undermines the decision [to ban Russia]," Nelson said, referring to the possibility that some Russian track and field athletes may be allowed to go to Rio. "I'm an 'athletes' rights' person, so I want to give them every opportunity to compete," he added. "But the reality is, you make a ban on a country and then you allow the athletes to compete, it sends a mixed message." Nelson wasn't in Eugene just for his medal ceremony. At age 40, he came out of retirement and attempted to make his fourth Olympic team. But there was another motivation as well: anger about the Russian doping scandal. "When I hear about corruption to the scale that was going on at that point, this is only one instance that we found out about," he said. "How many times did it happen before that we didn't find out?" Nelson finished seventh in the shot put, and only the top three finishers made the team. But he still took home a well-deserved gold medal, even if it was 12 years late in coming.